The End of the Protective Service Boom? When Americans say they want more security these days, they mean data security or financial security, not security guards. That’s why the decades-long growth of “protective service” occupations may finally be coming to an end. According to data from the BLS, the number of Americans working in “protective service” occupations rose by 28% from 2000 to 2010, an astonishing performance considering that overall employment rose by only 2% over this period. Protective service occupations include police, firefighters, correctional officers, fish and game wardens, private detectives, security guards, and crossing guards (yes, crossing guards, all sixty thousand of them). Note that protective service workers are in both the public and and private sectors. So, for example, guards at privately-run prisons would be in the protective service occupations. As this chart shows, the boom in protective service occupations finally started to tail off just as the rest of the economy has been recovering. 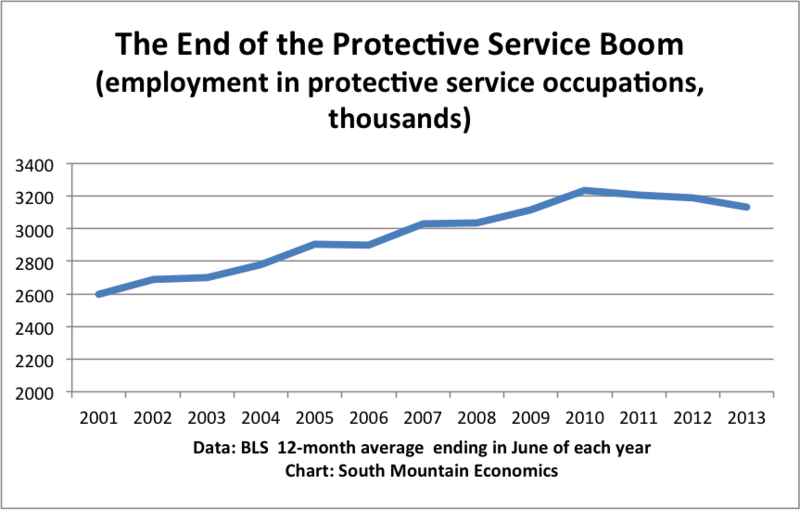 Since 2010 protective service employment has fallen at a slow but steady rate. Part of this downward trends comes from the fiscal squeeze at the state and local level. With less funds, it’s harder to hire police and firefighters. The correctional boom may finally have run its course as well, with the number of prisoners dropping for the third straight year. But the bigger picture is that Americans may be deciding that other worries are more important than the threats of physical crime and physical terrorism. We anticipate that trend continuing–the dangers in the cyber world are going to take more attention from now on. For a company, it’s annoying to have your building broken into, but it’s potentially disastrous to have your data hacked.